Finally, a throwing star that lives up to the hype! This thrower is probably the largest and most unique throwing star that you will find. 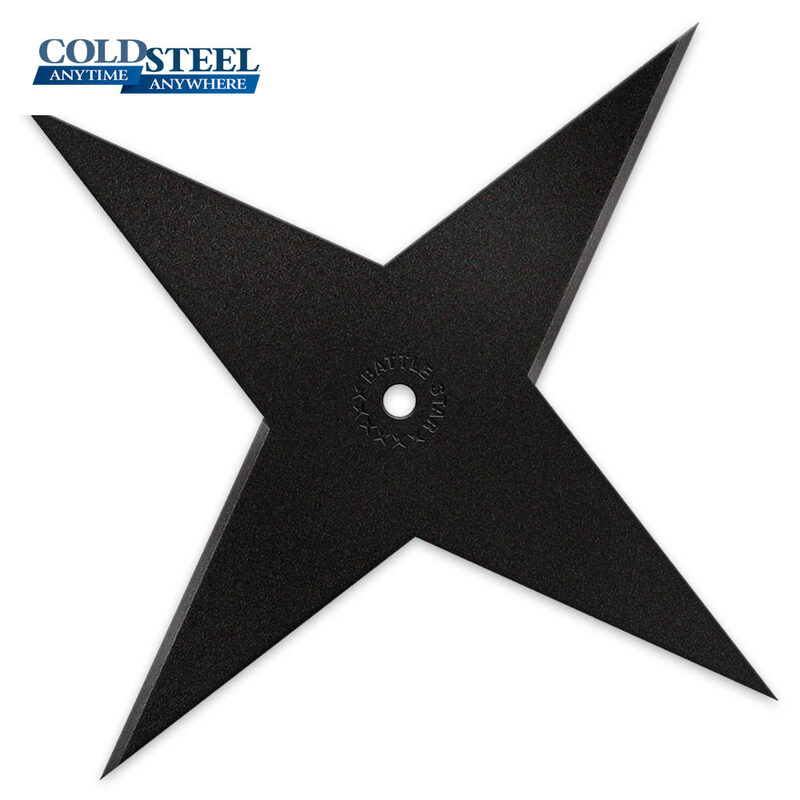 Constructed of 1055 carbon steel with a black coating, the sturdy points of this throwing star make it an effective hand-to-hand weapon. This truly is a throwing star unlike any other! Because this item doesn't send to me (even though other throwing stars do on this site), I order two of these off of another site and I can say that they are really awesome throwing stars. They do not bend and have tremendous power!!! I hope that someday this site let's these be ordered to Virginia like the other stars can because I want more but not for the prices that the other sites have them for. I love this star. Easily one of my favorites now. Buy this star. These throwing stars are amazing they stick every time in wood and even go through sheet metal when thrown with a decent amount of force they are super tough and don't chip or bend these are built to last a lifetime they do not have a sharp edge at all but you don't want it to so you don't cut yourself when throwing it in fact since each blade on this huge throwing star is just over 4 inches long and aren't sharp you can even hold it by one of the blades and use it as a dagger with a big crossgaurd that can be thrown and is gauranteed to stick if you hit someone with a normal sized throwing star the chances of it stopping them is slim since they are so small but hit them with this and you will couse a great amount of damage to your attacker. these throwing stars are awesome, fun to throw, and are made to last a lifetime. When thrown, this star is powerful and accurate! Short distances are a piece of cake, even long distances are very precise. I was hitting a target with this star at over 50 yards! It curves nicely during long distance throws, I even got it to double curve back and forth for greater distances with awesome accuracy. It hasn't chipped or cracked after hitting trees, plastic barrels and even rock. It's large and has a nice weight to it. The ONLY throwing star worth owning in my opinion. I've had my stars for about 3 years and I lost one and found it two years later stuck in the tree it had lasted through two very harsh winters and every rainfall and when I found it finally it had absolutely no rust no cracks and is still sturdy as ever now my trio is back together again and I'm on here hoping to buy more! Great knife. Really helped against the land squids in the woods around my house. Good knife. Great buy. Has never broken. Well it is big like huge but it is still very cool. Everyone needs to get one of these things.